I can’t seem to get warm these days. As I sit here writing I have on two pair of pants, big fuzzy socks and fingerless mittens. According to Ayurveda, we are a reflection of nature and therefore the seasons have a huge impact on our state of wellbeing – mind, body and emotions. Winter is considered a time of reflection, deep receptivity, and a time of building vitality. The season of winter asks us to slow down, look inwards and take time out for much needed restoration. Here in the PNW, winters are cloudy and gray and the weather is cold, damp, and heavy. Generally, winter is considered kapha season and embodies the earth and water elements. 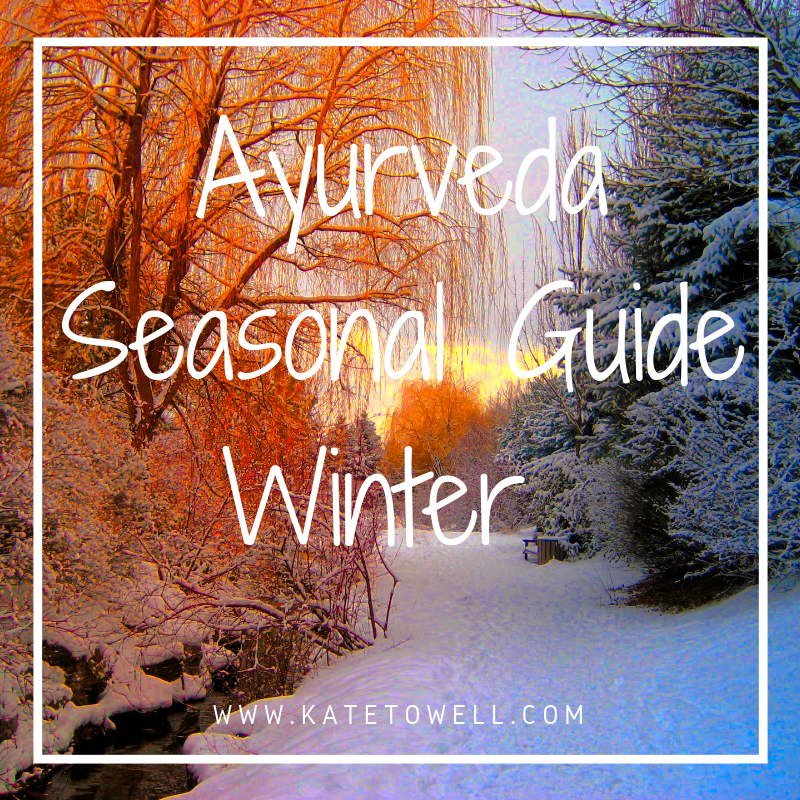 Seattle winter weather is classically kaphagentic in nature but depending on where you live, winter can also be dry, cold and windy, qualities that provoke vata dosha (air/space elements). When balanced, kapha gives us strength, stability, a strong immune system and a relaxed, laid-back attitude. But in excess, it can lead to sluggishness, mucus-filled colds, excess weight, and negative emotions such as dullness, attachment and depression. Ayurveda teaches us that like increases like and that opposites qualities create balance. In general, during the winter we want to adopt habits that balance the vitality and strength building aspects of kapha without creating stagnation, too much heaviness or dullness. Seek Warmth – To balance the cold nature of both kapha and vata energies seek out warmth. Eat warm, nourishing foods and use mildly warming spices like ginger, cinnamon and black pepper. Sip warm water throughout your day and avoid cold drinks especially one’s with ice. Wear warm layers and protect your head, neck and ears from the cold and wind. Be OK with Quiet – We where hiking yesterday and ran into some people that had an external speaker on their backpack that was blasting music into the wilderness. What? Try turning the car radio off, seek out times of quiet reflection, listen more deeply and talk less. Keep Moving – Exercise is one of the best ways to support optimal physical and mental health through the winter months. It’s important to listen to your body this winter. If you’re feeling overextended, stressed-out or fatigued, favor more slower paced types of movement like walking, slow flow yoga or nature hikes (weather permitting). On the other hand, if you’re feeling sluggish, heavy, or dull try a more vigorous workout—snowshoe, snowboard, a faster-paced vinyasa class or a group exercise class. Either way, the best time to exercise is in the morning, from 6–10 a.m.
Open Your Heart – Yes. Winter is a great time to incorporate more back bending into your yoga practice but also invite more laughter and light-heartedness into your days. Watch your favorite comedy, call a friend that makes you laugh, do something you love that you haven’t done in a while and simply smile more. Adopting a seasonal routine is an invaluable gift you can give yourself this winter and a long-term investment in your health and vitality. This winter nourish yourself, slow down, and find some time for stillness, self-reflection and a bit of laughter.